When making this recipe for myself, I like to bake in a loaf pan and cut it into long biscotti or paximadi type slices and toast them in the oven to have with coffee. For company or to serve as desert, I cook it in a 8×8 inch brownie pan, cut into 3x3inch squares and dust with powdered sugar. My mom and her mother both bake it in a round pan, cut like you would a pie and soak it in sweet syrup. Any way you choose, this will quickly become a favorite! Oranges feature prominently in this recipe and add a twist of citrussy sweetness that brightens and lightens the corn flavor perfectly. 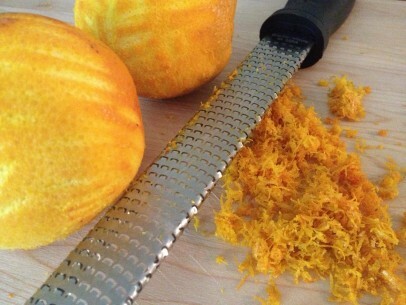 Both orange juice and zest are called for here and, if you have the time, I highly recommend using fresh squeezed juice. 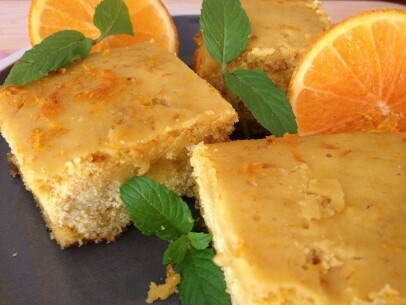 It only takes 2-3 oranges and is well worth the few minutes of extra effort, I promise. The texture of the cake is a matter of preference really as all varieties taste wonderful. If you use all cornmeal, you’ll have a more dense cake and crumbly texture. 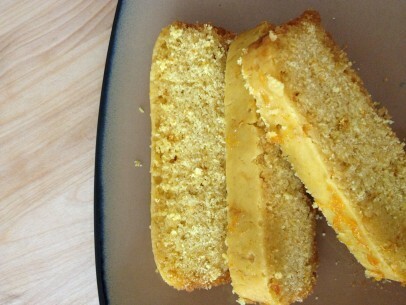 Half cornmeal and half corn flour will yield a lighter cake while incorporating the traditional cornmeal bits. All cornflour will give you a light cake with the corn flavor and texture very much like an American style cornbread. The choice of oil is also up to you, the cook. My yiayia always used sesame oil and so do I. It was used only for her special dishes and I think it adds a lovely, nutty flavor to your bobota. Many cooks use a light olive oil as have I on occasion, with fine results. You can always use vegetable oil if the heavier flavors of the sesame or olive oil are not to your liking. It may seem unusual to use them in baking but give the more authentic oils a try and I think you’ll be pleasantly surprised. Important to note, this is a lightly sweetened cornbread. Much of the sweetness, or not, comes after the cake is baked and again is according to your taste. You can enjoy your bobota as is or sweeten with powdered sugar or flavored syrup, it’s completely up to you. A hint of cardamom in the batter is the trick to tempering the taste of baking powder which, along with a pinch of baking soda, are your only leaveners here. Traditionally, Greek cooks used ammonia to leaven cakes. It has less of a bitter aftertaste than baking powder/soda but is more difficult to find. Because the recipe calls for 3 tbsp of oil, the cake pan you choose will not need a lot of greasing. When using a loaf pan, I like to cut a piece of parchment paper and simply lift the uncut edges to easily remove the cake from the pan once its cooked. When baking, be careful not to overcook as the bobota will quickly become dry and hard. 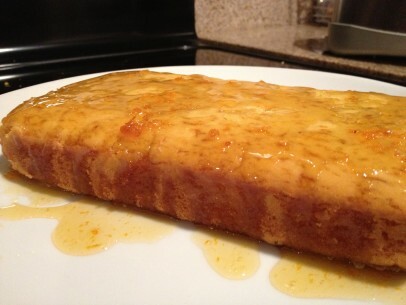 Check that the edges of your cake are just golden brown and the center is set. A clean toothpick is not always the best test here so remember to keep an eye on the color. For a loaf pan, 30-35 minutes at 350 degrees is just about right. For an 8″ round pan, I’d give it another 5 minutes more at the same temp but again, use the color of your edges as your guide. If you choose to go with a loaf pan, cut a few slices about 1 1/2′ – 2 ” wide and toast them in the oven to have with coffee or tea. The toasting amplifies the nutty corn flavor and is yet another yummy way to enjoy bobota. Combine dry ingredients (except sugar) in large bowl, making sure there are no lumps in the cornmeal or corn flour. In a separate bowl, whisk the orange juice, water and sugar with a fork until sugar is completely dissolved. Add oil and whisk wet ingredients together well. Combine wet and dry ingredients and mix gently until there are no lumps. Do not over mix. 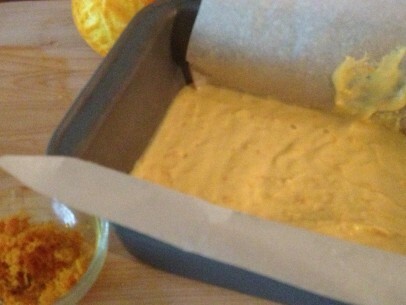 Fold in the orange zest and pour into pan. While your bobota is baking, add all syrup ingredients to pan and bring to a low simmer over medium heat. 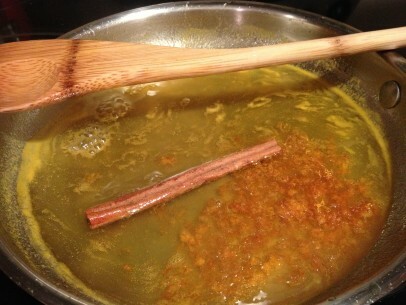 Simmer gently for 5 minutes, set aside until needed and remove cinnamon stick before using. This recipe looks great Kiki. That sweet syrup drizzled on top of the bobota looks devine. Yum! Thanks, I can’t wait to try it!